Less than a week after announcing that the NHLPA Goals & Dreams fund would be donating over 800 sets of hockey equipment valued at $350,000 to children around the world to kick-off the 2010-11 season, the program has already been busy getting that equipment into the hands of the worthy recipients. On Monday, some special guests were in attendance at the First Air Cargo Facility in Gloucester, ON, to help load 50 sets of freshly donated equipment from NHLPA Goals & Dreams onto a cargo plane bound for Hall Beach, Nunavut where it will be distributed in conjunction with Project North. Longtime Ottawa Senator and NHLPA member Chris Phillips was on hand to help mark the occasion, and was joined by Mrs. Laureen Harper, wife of Canadian Prime Minister Stephen Harper. Representatives from NHLPA Goals & Dreams, Project North, and First Air were also in Gloucester to be a part of the event. Heidi Langille, National Aboriginal Role Model 2010 and representative of the Ottawa Inuit Children's Centre received the equipment on behalf of the community. 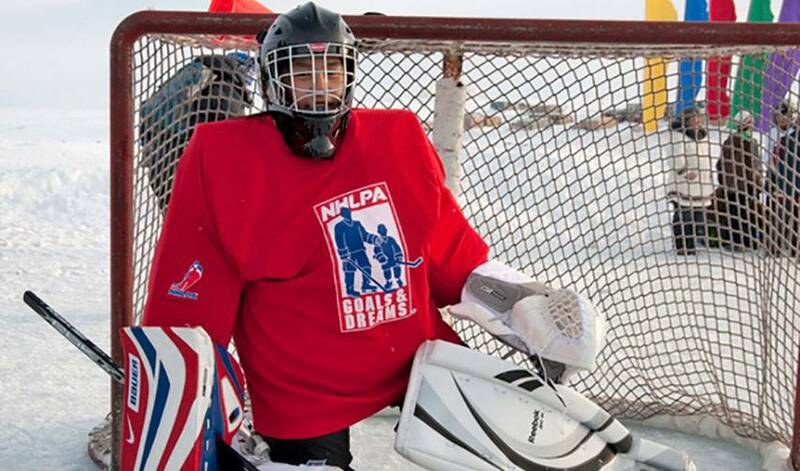 Project North, which is a group that works towards bettering the lives of children in the Canadian North, is a repeat partner of NHLPA Goals & Dreams, having received 50 sets of equipment that was spread among three separate Inuit communities last year. Michelle Valberg, who is the co-founder and chair of Project North, is thrilled that the players are contributing equipment to these children for the second year in a row. Devin Smith, Chairman of NHLPA Goals & Dreams, was also in Gloucester to help make the equipment delivery, and echoed Valberg's sentiments about the positive impact that the donation will have on the children of the community. One of the biggest obstacles that Inuit people face is that Nunavut, and much of the far north, lacks easy accessibility to the rest of Canada, resulting in all items needing to be shipped to the area and directly contributes to making costly items like hockey equipment even more expensive. The equipment donation would not have been accomplished without the generous support from First Air, who is flying the equipment and its accompanying passengers into Nunavut. Chris Ferris, Director of Marketing and Sales for First Air spoke on behalf of the airline and discussed the impact such projects has on the company.